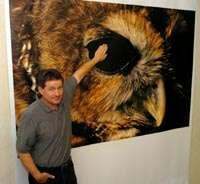 Native of Nebraska and National Geographic photographer Joel Sartore is seen with one of his banner prints of spotted owl to be displayed in Morrill Hall on the UNL Campus to help raise funds and memberships for the state museums this June. Photo on Tuesday, May 18, 2004. We are killing off the Ark. All plants and animals, even the Salt Creek tiger beetle, are God's creatures. Who are we to purposefully kill off any of these creations? Wildlife photography exhibits often instruct viewers with pretty pictures and lovely landscapes. Photographer Joel Sartore affords plenty of beauty with his new exhibit at the University of Nebraska State Museum titled "Fragile Nature: A Personal View." The show features dazzling images of gray wolves, grizzly bears, alligators, bald eagles, prairie dogs and all manner of wild organisms the Lincoln photographer has documented in 14 years for National Geographic. But he also displays some downright ugliness. Like fogging planes dropping insecticide on neighborhoods in Lee County, Fla. Or clear-cutting of national forests in Idaho. And wave after wave of suburban development in Orange County, Calif. Being an eyewitness to the systematic destruction of our natural world has left Sartore's optimism tattered and torn. His show simply refuses to give false comfort to his audience about the direction in which we are headed on this planet. "To me, it's important to put pretty pictures in context," Sartore said. "To me, it's crucial to tell the entire story." Delivering a message about the need for 11th-hour conservation is one goal of Sartore's show. The other is to draw attention and support for the State Museum, which has weathered an onslaught of its own in the form of state budget cuts. The opening reception for "Fragile Nature" will be June 5 at Morrill Hall. The event, featuring an address by Sartore, is open only to members of the Friends of the University of Nebraska State Museum. Sartore invites people with an interest in natural history to join the friends group and attend the event. From his childhood in Ralston, Sartore has great memories of traveling with his father to Lincoln to visit the museum. "Elephant Hall and the Capitol Rotunda, to me, are the best spots in the state," he said. More than ever, the State Museum needs visitors to help offset the loss of nearly half of its state funding. The cuts led to the elimination of eight tenured faculty positions and 15 full-time staff positions. While the cuts brought dramatic change, museum administrators have continued both the research and the public education missions of the institution. Unfortunately, Morrill Hall continues to suffer from public perception that it has reduced hours, eliminated public programs or closed its doors altogether, said State Museum Director Priscilla Grew. "The museum has been through a very tough time," she said. "But we have things stabilized and we're ready to move forward." Sartore's show represents an effort to tell everyone the museum is alive and well. The Alltel Corp. gave $10,000 to put on the show, but most of that money will benefit Morrill Hall directly. That's because Sartore waived his fees, the National Geographic Society donated the cost of photographic prints and Against the Wall Gallery provided framing at cost. In addition, SignCo donated reproduction of some of Sartore's images into massive banners. Not only will the show benefit the museum, but its message fits in perfectly with the role of a natural history museum, said faculty member Judy Diamond. "I think the message is the incredibly precarious position many wildlife species are in right now," she said. "And the importance of recognizing the threats these plants and animals face." Sartore, who wrote the text for the exhibit, urges people to inform themselves about wildlife issues and to vote accordingly. He offers examples of what has worked with the hope it can work again. And while he has spent time in places as diverse as South America and Alaska, viewers of his show will be confronted with the plight of an endangered species in Lincoln. It's not accidental the largest photographic print in the exhibit is of the Salt Creek tiger beetle. As Sartore considers the push of development into the last remaining saline marshes and creeks where the beetle hangs on, he searches once again for optimism. "Lincoln is the kind of place where we can afford to be generous to the land," he said. "We're not starving, we're not a developing nation. "There's lots of people trying their best to save the saline marshes of Lancaster County, but I don't know if it's going to be enough." The State Museum is open 9:30 a.m.-4:30 p.m. Monday-Saturday and 1:30-4:30 p.m. Sundays and holidays. Admission for adults is $4; children 5-18, $2; children younger than 5, free; families with up to two adults and children $8; UNL students, faculty and staff are free. Reach Joe Duggan at 473-7239 or jduggan@;journalstar.com.